Steven Wallace (left), president of the Southern Midcoast Maine Chamber, greets Gov. 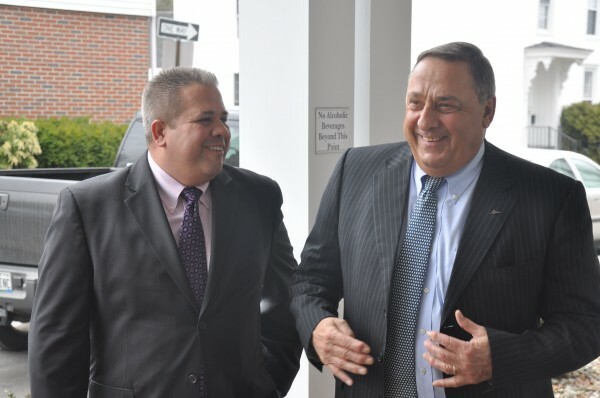 Paul LePage as he arrives for a chamber luncheon at the Inn at Brunswick Station in Brunswick on April 10, 2013. BRUNSWICK, Maine — Gov. Paul LePage said Wednesday he hasn’t made a final decision on whether to veto a bill on track to pass the Legislature that would raise the state’s minimum wage to $9 by 2016, then boost it annually in proportion with increases in the Consumer Price Index. The bill, LD 611, faces one more vote in the Senate, where it previously has passed 19-16 along party lines. During an appearance at a Southern Midcoast Maine Chamber luncheon in Brunswick, LePage said he had concerns about the bill and wanted to better understand what types of workers are actually earning Maine’s minimum wage of $7.50 an hour. “I don’t see the point of having the highest minimum wage in the country when our economy is in the tank,” he said. The bill has passed in a series of party-line votes in both the House and Senate, where Democrats supported the increase and Republicans opposed it. Only one Democrat, Rep. Alan Casavant of Biddeford, broke ranks with his party to oppose the increase. Washington, where the minimum wage rises with inflation, currently has the highest minimum wage in the nation at $9.19 per hour. In New York, the Assembly recently approved a measure to raise that state’s minimum wage to $9 by 2016 and index it to inflation. LePage also discussed his education reform initiatives at the chamber luncheon. Maine in the coming weeks will give its public schools a letter grade, A through F, in an effort to improve accountability and determine which schools need the most help, he said, referring to a program he first mentioned during his State of the State address on Feb. 5. “The only equalizer — whether you’re poor or wealthy — is what you put up here, in that four inches between your ears,” he said, stressing the importance of education in preparing Maine students for future careers. The program is similar to one implemented by Florida, which LePage heralded during the lunch for adopting best practices that have yielded measurable change in the educational outcomes of its children. Twenty years ago, LePage said, Florida was ranked near the bottom for educational outcomes while Maine was ranked near the top. Today, though Maine’s test scores haven’t declined, the two states have switched places, he said. Florida spends $11,000 per student per year and yields better results than Maine, which spends about $15,000 per student per year, LePage said. “That’s completely unacceptable for our kids,” he said. While “the mantra in Florida is ‘students first,’” it’s the superintendents and the unions that are the only winners in Maine’s current educational system, he said. Kids and the teachers, he said, are the losers. Florida has 2.7 million students and 56 superintendents, LePage said by way of introducing his next point: Maine has only 185,000 students, but 127 superintendents. “We do have good students — it’s just that everyone else around the country is using best practices and putting kids first,” he said. From the Brunswick event, LePage headed straight to the airport to catch a flight to Florida, where he said he’d be speaking with Jeb Bush about education reform and attending the Job Creators Alliance’s Free Enterprise Leadership Summit as a featured speaker. While the Maine Senate on Wednesday delayed final action on the minimum wage bill, the chamber voted 26-8 against a bill that would require motorcyclists wear helmets and 25-9 against legislation that would bar drivers from using hand-held cellphones while driving.